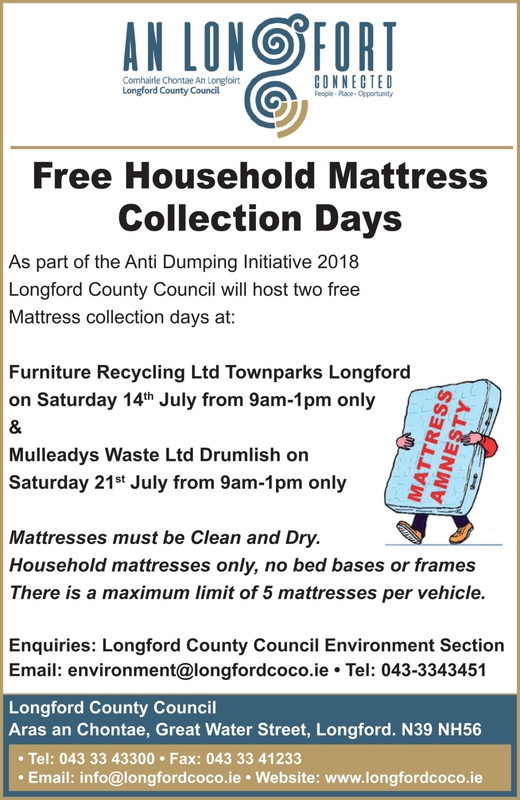 As part of the Anti Dumping Initiative 2018, Longford County Council will host two free household mattress collection days. The first collection day is on Saturday, July 14 from 9am to 1pm only at Furniture Recycling Ltd, Towns Park, Longford. And the second collection is on Saturday, July 21 from 9am to 1pm only at Mulleady's Waste Ltd, Drumlish. Mattresses must be clean and dry. Household mattresses only, no bed bases or frames. There is a maximum limit of 5 mattresses per vehicle.